Paric, a St. Louis based construction manager and general contractor has hired two new Project Engineers to help in the development of estimates, schedules, and qualifications. 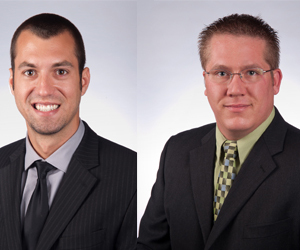 Kevin Ruck and David Sanders both bring an abundance of experience to the Paric team. ngineer for K&S Associates. He is currently working on the Washington University Cyclotron project. Sanders earned a Bachelor of Science degree in Construction Management with a minor in business administration from Southern Illinois University. He holds the OSHA 30 Hour Safety Card and is a certified Installer and Quality Control with ABAA. Prior to joining Paric, Sanders worked as an assistant superintendent, installer, and project engineer for various companies in Missouri and Illinois. David is currently working on the a couple electrical cooperative projects.